If Friends Were Flours, I’d Pick You. Just thinking about the scent of freshly baked bread makes my tummy rumble. There is nothing like filling your home with the comforting scent of bread baking in the oven. However, for us to enjoy this heavenly scent, we have to have one crucial ingredient in our cupboard: FLOUR. Being Gluten Free (GF) brings a whole new challenge to the baking scene, particularly when it comes to flour. Not able to reach for your generic all-purpose, you are faced with a slew of foreigners: coconut flour, amaranth flour (what is that, anyway? ), gluten free mixes, almond and tapioca flour, brown rice and potato flour, etc. How do you know which kind to use? What brand is best? After having tried all of the above, I have thus far narrowed it down to three go-to flours: Almond Flour, Coconut Flour and a Gluten Free All Purpose Flour Mix by Arrowhead Mills. Word to the wise: while Bob’s Red Mill has a number of good products, unfortunately their Gluten Free Flour is not one of them. I made the sad mistake of using it for dessert one day and unless you want your ooey-gooey cookies to taste like little iron orbs, go with Arrowhead Mills! Almond flour is probably my favorite with its nutty, yet slightly sweet flavor, rustic texture and nutritional benefits. It is great used in cookie, muffin and even pancake recipes. 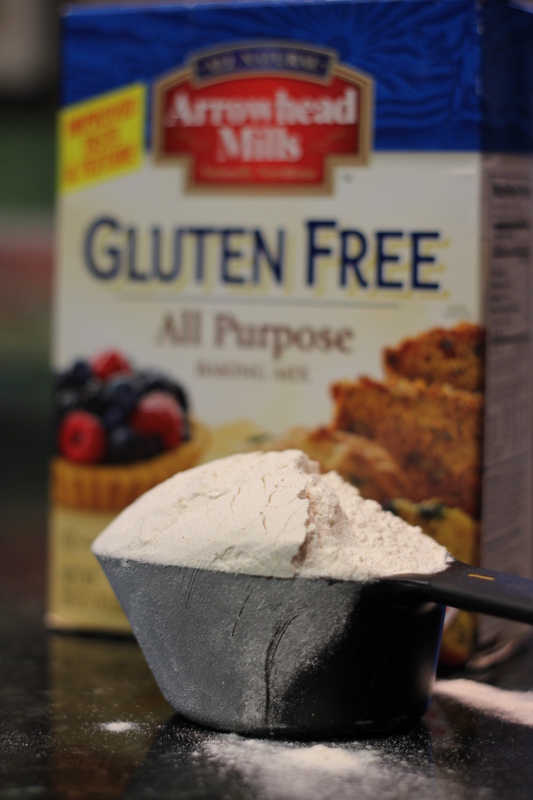 For bread recipes, Arrowhead Mills’ GF Flour is ideal. Coconut flour is also great and can be combined with other flours; it can stand on its own, too, but keep in mind that it has a drier consistency when used alone. You can find these flours at your local health food store, such as Earth Fare or Whole Foods, as well as some regular grocery stores. In fact, Publix and Walmart have started to carry more GF products! Each have their own Gluten Free section where you can find various GF flours and mixes. If you can’t find them at your local market, below are some links for ordering on-line. When it comes to storage, I keep both my Gluten Free Flour Mix, as well as my Almond Flour, in the pantry (both should be stored in the fridge or freezer if kept for a lengthy period of time). However, I have found that Coconut Flour is best kept refrigerated right away. If you have any questions or simply want to share about your own discoveries in baking, feel free to comment!